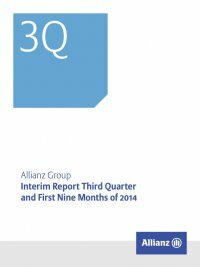 83Interim Report Third Quarter and First Nine Months of 2014 Allianz Group B Condensed Consolidated Interim Financial Statements 49 Consolidated Balance Sheets 50 Consolidated Income Statements 51 Consolidated Statements of Comprehensive Income 52 Consolidated Statements of Changes in Equity 53 Consolidated Statements of Cash Flows 55 Notes 11 – Non-current assets and assets and liabilities of disposal groups classified as held for sale Non-current assets and assets and liabilities of disposal groups classified as held for sale € mn as of 30 September 2014 as of 31 December 2013 Assets of disposal groups classified as held for sale OJSC “Allianz Investments”, Moscow 5 – Subtotal 5 – Non-current assets classified as held for sale Investments in associates and joint ventures 48 131 Real estate held for investment 69 – Real estate held for own use 59 16 Subtotal 176 147 Total 180 147 Liabilities of disposal groups classified as held for sale OJSC “Allianz Investments”, Moscow 3 – Total 3 – Assets and liabilities of disposal groups classified as held for sale During the third quarter of 2014, the ­Allianz Group decided to dispose ofOJSC“AllianzInvestments”,Moscow.Thus,theassetsandliabilities of this consolidated entity allocated to the reportable segment Growth Markets (Life/Health) were reclassified as held for sale. As of 30 September 2014, no cumulative gains or losses were recognized in othercomprehensiveincomerelatingtothedisposalgroupclassified as held for sale. The sale is expected to occur during the fourth quarter of 2014. Upon measurement of the disposal group at fair value less costs to sell, an impairment loss of € 3 mn was recognized for the three and the nine months ended 30 September 2014. Non-current assets classified as held for sale As of 30 September 2014, investments in associates and joint ventures comprised an investment of € 43 mn in a U.S. real estate company allocated to the reportable segment German Speaking Countries (Life/Health). Additionally, an investment of € 5 mn in an associated French media group allocated to the reportable segments German Speaking Countries (Property-Casualty and Life/Health) was classi- fied as held for sale. Upon measurement of both investments at fair value less costs to sell, no impairment loss was recognized for the three and the nine months ended 30 September 2014. The sale of both investments will be completed before 31 December 2014. The investment in an associated Italian real estate company allocated to the reportable segment Western and Southern Europe (Property-Casualty) was sold as expected during the third quarter of 2014. As of 30 September 2014, real estate held for investment classi- fied as held for sale comprised several office buildings allocated to the reportable segments German Speaking Countries (Life/Health) and Holding & Treasury. The sale of these buildings is expected to be completed by the end of the first quarter of 2015. Upon measurement of these buildings at fair value less costs to sell, no impairment loss was recognized for the three and the nine months ended 30 Septem- ber 2014. As of 30 September 2014, real estate held for own use comprised two office buildings allocated to the reportable segment Global Insur- anceLines & AngloMarkets(Property-Casualty)whichwereclassified as held for sale. Upon measurement of the real estate held for own use classified as held for sale at fair value less costs to sell, an impair- ment loss of € 17 mn was recognized for the three and the nine months ended 30 September 2014. The sale of these buildings will be completed by the end of the third quarter of 2015. Real estate held for own use comprised as of 31 December 2013 an office building allocated to the reportable segment Asset Manage- ment, which was sold as expected during the first quarter of 2014.